Well good on them - BF take note, re Bretagne In all seriousness I’ve fancied a trip on the Stena Europe for a while so perhaps this is the year to do it. Onboard Stena Nordica as Stena Europe is currently in Turkey for life extension work. Despite all the work Stena have done to the interior it is still recognisable as the European Ambassador and very close to how the European Causeway and Highlander now appear. That's interesting, they've really sent Stena Europe all the way to Turkey? Do you (or anyone else) know what the work consists of? As an addendum to the above, I think it is unfortunate that many people's general willingness to put up with low standards in the interest of 'getting a bargain' is responsible for the overall lowering of conditions in most forms of travel, particularly 'sardine tin' aircraft and trains. It's not really a bargain, you simply get what you pay for. The introduction of various forms of enhanced economy by some airlines, such as TUI and Thomas Cook on long haul holiday routes is proving to be increasingly popular. Same thing is happening in other areas of the economy. Many new houses are so much smaller than older ones that they are fitted with reduced size furniture to disguise it but the builders still insist on top dollar for their brick faced cardboard boxes. The equivalent to my 1960s built house today has only 80% of the floor space. I know what you mean regarding houses. Like many parts of the country, new estates are springing up literally everywhere in my area but if I compare the equivalent new-build property nearby with my comparatively modern house built in 1994, the plots are so much smaller today with virtually no gardens and allocated parking, as opposed to an actual driveway, apparently considered a luxury! I for one very much hope so. Lovely photos. I personally think Bretagne looks good from just about every angle; I think even a Looney-Tunes livery would struggle to detract from those elegant lines. If she is going to be in the fleet a few more years, I really hope that BF don't cutback on her upkeep. Why did they change the Bretagne's tannoy chime in 2014? My favourite one is Pont-Aven's - I really like the deep 'bong' sound hers makes. I see a few others have copied her over the years though..
Well if BF are planning to sell Cap Finistere within the next few years there's surely not much point in converting her to run on LNG. There must be at least a fair chance we'll find out within a few years...! This is still provisional but DFDS have accepted my booking, so hopefully I'll finally get to experience sailing on a freight vessel and take the only scheduled passenger-carrying ferry to Scandinavia in the process. Looking at the current schedule it should be the Selandia Seaways. I would very much welcome any tips/advice from anyone who was done this trip, or any similar journey...! I would go further than that Gareth. I think referendums are intrinsically bad as they rarely seem to resolve the issue they were called for and simply create grief and unexpected consequences as we are now seeing. They are no substitute for good parliamentary democracy and informed debate (although that seems to be in danger itself now). Referendums attempt to reduce complex issues down to simple black and white choices and really life ain't like that. Anyone who claims to have understood the ramifications of Brexit at the time the referendum was held is telling porkies, however much they might insist otherwise. I voted remain, not because I thought Britain is better off inside the EU which is a seriously flawed institution but because my career experience clearly indicated to me that the process of extracting ourselves from such a complex embedded situation is likely to be ruinous in the short to medium term. Had we never joined the EU the chances are that we might be doing OK in a different international structure but we will never know. What I am rather depressingly certain of is that if we do leave without at least a decent deal then I shall probably be dead before the long term benefits (if any) become apparent. Having travelled in a number of European countries over the years I do value being a European and if the EU had stuck with being a powerful trading association to mutual advantage instead of aspiring to a supra national federal empire I would have been quite happy with that. A view which I suspect may well be shared by an awful lot of EU citizens and which still may come about at some point given the rise of populism in member countries. Weird one this. Seems a tad pointless, because if the sailing is delayed by 1 hour, it'll be made up. Unconvinced on what Brexiteers intend on getting out of this. The interior design of the WBY was by Steen Friis, who also did things like the Maersk Ds, Stena's rather nice Killingholme ships, and knocked the Hammerodde and Dueodde into shape to make them vaguely appealing compared to the rather horrible Ben my Chree from which they were derived. The design approach for all those vessels is for them to be modern, quite elegant but distinctly understated which is an approach carried onto the WBY. Closer to home, Steen Friis also did the Dana Sirena in her original DFDS guise, and their masterpiece was supposed to be the Norman Leader where the company was responsible for softening her brutal exterior lines, looking after the entire interior, the graphic design including signage plus developing LD Lines' corporate identity. I quite like the Yeats - although she could do with a bit more colour, the approach is rather more sophisticated than the absolute monocrhome applied to things like the DFDS North Shields ships in their most recent guises. Certainly dispensing with things like the awful, vast Irish pub on the Ulysses is a step forward. But the compromises between her short sea and long-distance modes present themselves in things like the absence of a proper show bar, a place for entertainment or a proper kids play area. She's quite nice for three or four hours but a long crossing to France...? Perhaps less so. I've only sailed on the Ulysses the once and was distinctly under-whelmed, but I have to say I thought the large 'Irish pub' overlooking the bow was probably her best feature...! Where is Oscar Wilde at the moment, laid up? Has she been sold? I've read that DFDS' current CEO Niels Smedegaard is standing down at the end of April. I wonder if this will mean any kind of change in direction for the company? Based on my experience to Honfleur, I'd happily book again for next NYE. I'd be more than happy with Rouen since I've never experienced the trip up the Seine. I thought BF did a great job and Pont-Aven suited her role as "cruise" ship perfectly; as I've said previously it was much more civilised than being ordered off the ship first thing each morning. Stena Line certainly has the know-how and the ships. The two current vessels on Birkenhead-Belfast will soon be available, as has been mentioned, so it will be interesting to see where they end up. Personally i'd like to see Stena have more of a presence both in the Channel and also on the North Sea. What is the flag she's flying from her bow? It's not the Norman flag is it? 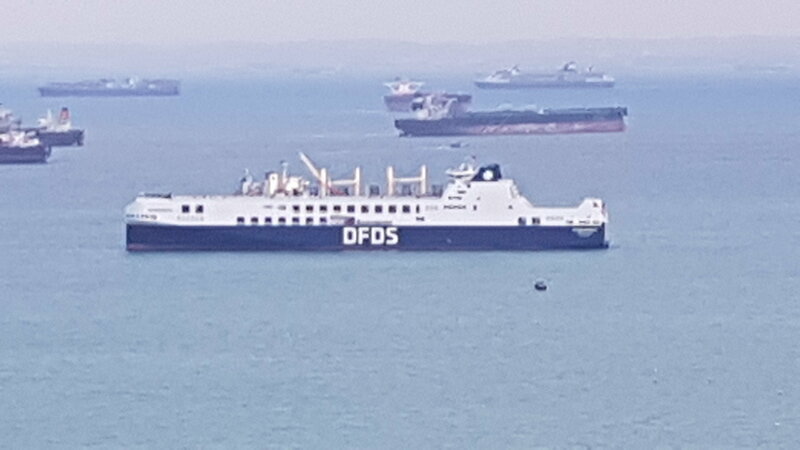 The new DFDS Gothia Seaways is at anchor in the Singapore Strait. It's been there since early morning (about 12 hours). I believe this is one of two ro-ro ships of the same class. The thing with Bretagne is you can only do so much economically, you can’t increase headroom,size of the portholes, car decks , it just isn’t worth it , I think if BF had expected to keep her for 30 + years they might have improved the cabin layout, restaurant and shops , but the fact is it isn’t going to happen now and BF would ideally have sold her by now and put the money into a more efficient ship and one that is more acceptable to modern day travelers needs. Well I'm certainly no expert here, but I would have thought that if the likes of Viking Line & DFDS can work wonders with their older tonnage, then BF could have done more to modernise Bretagne. I take the points about wanting to replace her etc, but they haven't. It's been a while since I last sailed on Bretagne so I can't really comment directly on how she is today, but I would have thought the worst thing they could do is to allow things to stagnate. I've only sailed on Armorique once, quite deliberately, back from Roscoff because I wanted to see for myself. I like her, nice cabin, nice bar, more than adequate for the crossing. And she has clearly proved her worth by being able to deputise on all of the other routes and no doubt being more economical to run than some others in the fleet. I do take issue with these comments about the Bretagne being too old and 'past it'. As myself and others have pointed out, there are plenty of ferries from the same era sailing in northern Europe today which have been brought right up to date internally and which I dare say most of their passengers would have no idea as to the fact they were built in the 1980s. These ferries are still doing a good job. I think the issue with Bretagne is that her owners have not invested enough to bring her fully up to date, rather than the fact she was built in 1989. Every ferry crossing the Bay of Biscay should have one or something similar rather than the snub nosed monstrosity someone had the audacity to weld onto the front of Pont Aven... an awful bow, historically it's no wonder her clamshells need attention especially on vessel with a 30+ metre beam which smashes through waves rather than ride them... Should have built her 200m and given her a decent bow. Perhaps stating the obvious here but is this why Cap Finistere (according to some) copes better with the Spanish routes than Pont-Aven? Despite being a second-hand purchase rather than a purpose-built flagship? It's a source of some regret to me that I've never managed to sail to Spain on Bretagne, I doubt I will get the chance now but should a crossing appear in the timetable I'd jump at it.